PRO-BIOTIC with FOS | INTESTINAL FLORA SUPPORT - ProBiotic with FOS specialize in destroying anaerobic or parasitic bacteria. Are you destroying your 'Second Immune System?' Did you know that if you are over 20 years old and you eat one or more meals a day that contain meat based proteins, you may be deteriorating your second immune system? 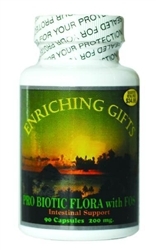 Pro-Biotics with FOS helps promote a healthy balance of friendly flora in the gastrointestinal tract. Are you destroying your 'Second Immune System?' Did you know that if you are over 20 years old and you eat one or more meals a day that contain meat based proteins, you may be deteriorating your second immune system? Pro-Biotics help promote a healthy balance of friendly flora in the gastrointestinal tract. This Pro-Biotic with FOS™ has bacterial strains that may improve absorption of minerals and reduce toxins in your G.I. tract. Having ‘friendly’ bacteria in the intestines is one of the keys to boosting the immune system. These ‘friendly’ bacteria are destroyed by such common factors as carbonated drinks, laxatives, birth control pills, coffee, alcohol, aging, stress, antibiotics (taken for infections and even antibiotics found in the meat we eat), colds and flu’s. Pro Biotic Flora with FOS has not one, but eight ‘good-guy’ bacterial strains. These eight strains are selected and manufactured according to the proprietary processes developed by Dr. Khem Shahani, the world’s leading expert in the area of friendly bacteria. ACTS as the body’s ‘second immune system’. PROVIDES 8 strains of friendly flora bacteria. HELPS SUPPORT and produce enzymes which are essential to proper intestinal function. Recent research has shown how important it is to take pro-biotics, and our family takes this for our immune system and use this brand, where the bacteria are not released too soon, so they can benefit the large intestine!